Should Boeing Shrink Its Stock? One Fool answers with a resounding "Yes!" Faced with the prospects of slowing revenues and declining profits for the foreseeable future, defense contractor Northrop Grumman (NYSE:NOC) has announced a plan to boost its earnings dramatically -- by buying back its own stock. But Northrop's hardly the only defense contractor facing a tough spending environment. And this raises the question: Could Boeing (NYSE:BA) stock be next in line for a big buyback? In a bold move, Northrop upped its planned stock buyback program to $5 billion last week, in effect declaring to Wall Street that even if earnings decline, the company will shrink its share count by 25% and force its per-share earnings to grow. How? Simple math tells you that if Northrop earns (hypothetically) $1 million and divides this profit among (still hypothetically) 1 million shares, this results in $1 per share in profit. But if you shrink the share count to 750,000 -- on the same $1 million, firmwide profit -- then each remaining share can lay claim to $1.33 of the profits. Presto change-o -- Northrop produces 33% profits growth! In Northrop's case, this makes sense. Analysts think Northrop's profits will decline by about 2.6% on average over the next five years. 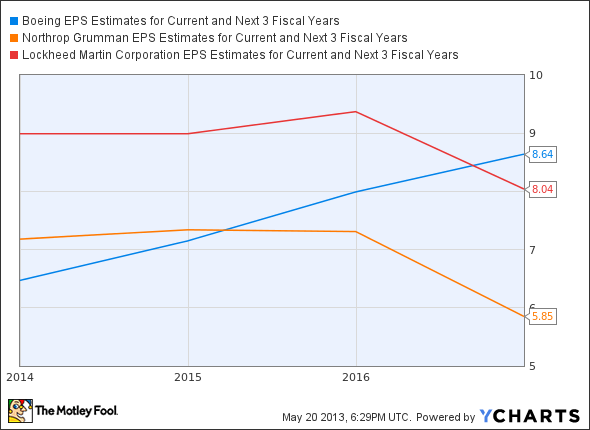 But a 33% boost to per-share earnings could cancel out these declines, and even get Northrop growing again. BA EPS Estimates for Current and Next 3 Fiscal Years data by YCharts. Northrop's plan to buy back $5 billion in shares over the next three years hinges upon its ability to come up with enough cash to fund the buyback. With $2.45 billion in annual cash profits, it's got more than enough cash for the purpose. 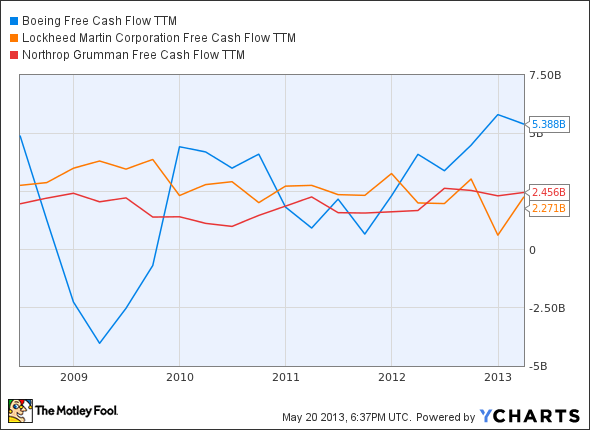 BA Free Cash Flow TTM data by YCharts. As it turns out, of course, Boeing is buying back stock. Back in December, it announced plans to resume stock repurchases that it suspended in 2009. But with only $3.6 billion in the buyback kitty, management's plans for Boeing stock are both smaller absolutely and much smaller in scope relative to the company's market cap, than the buyback that Northrop envisions. Given Boeing's superior financials, management should jump at the chance to turbocharge growth with a big buyback announcement. It's time to buy back some Boeing stock.